We turn today to Toad. He is some sort of mushroom man? This is about as legit a description as exists in Super Mario’s candy-colored nightmare of a video game series. It’s worth noting Toad is both a named character and also the name of a species of Toad-like people. This surreal synecdochic quality is shared by Yoshi, who is also a Yoshi. Toads, as a species, have existed since Super Mario Bros., but Toad, the individual, first appeared in the strange, oneiric Super Mario Bros. 2, slightly faster and stronger than the other characters, but worse at jumping. And he has reappeared periodically throughout the series and its offshoots, as a fast and light kart driver and a zippy little athlete. He is, it turns out, a sort of ward to Princess Peach, a position that is fitting for his people, who are the predominant species of the Mushroom Kingdom and the ones who give it its name despite the fact they are ruled over by (and perhaps in economic servitude to) an entirely different species of humanoids. Early localizations of the Mario games referred to them not as Mushroom People but as Mushroom Retainers, which is appropriate enough for the regional monarchy but a damning indictment of it all the same. I had always thought Toad was the star of Captain Toad: Treasure Tracker, but I was wrong. The star of Captain Toad: Treasure Tracker is a separate Toad named Captain Toad, who is a treasure tracker. 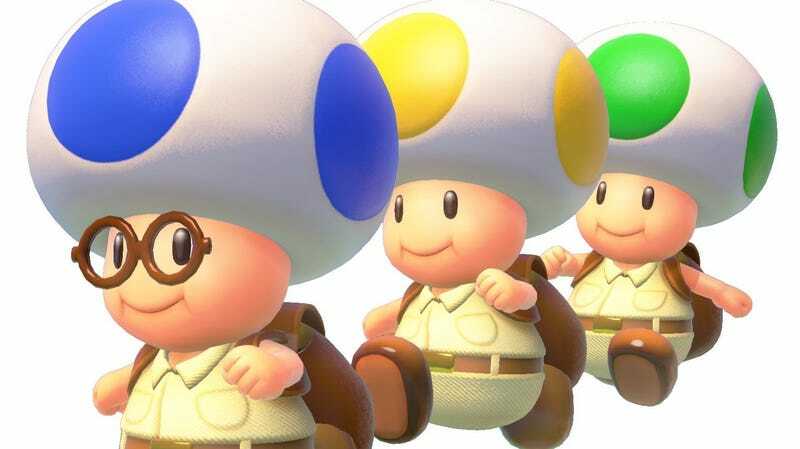 This is obvious enough in hindsight, but for all intents and purposes, the game feels like Toad’s great moment to shine, his first starring, titular role. It is, at the very least, the first for his species. It was originally released in 2014 for the beleaguered Wii U and recently rereleased for Nintendo’s much more successful Switch, and it remains an enduringly strange effort from the company—a prolonged stretch of tiny, cuboid levels through which you slowly pilot Captain Toad. They’re presented as these beguiling little cross sections cut straight out of the ground, confectionary dioramas full of possibility. You can see the layers of dirt, the water pressed up to an invisible edge. You rotate the camera around them slowly, gradually clearing a path for Captain Toad to traverse by pushing pneumatic levers and rotating tiny gears, eventually clambering toward a golden star at the end. It’s as much Monument Valley and Metal Gear Solid: VR Missions as it is Super Mario Bros. 2. Many of Captain Toad’s levels are built around a single idea, like a floating ship divided into three bobbing sections or a ghost-house journey atop invisible platforms. The names of each of the 82 levels pop with playable promise—Chute Scoot Slopes, Spinwheel Cog Ruins, Clear Pipe Puzzleplex—and compel you onward, even though, in classic Mario fashion, they start with an almost pop-art simplicity before turning maddeningly difficult. It’ll seem too simple until, suddenly, it doesn’t, and that familiar feeling of terror settles in, the nagging belief that you will never shoot through this one last straightaway successfully. Captain Toad may be a captain among his people, in other words, but he remains an attendant and inclined toward uniquely humiliating deaths here. Mario’s familiar two-hit deaths are firmly in place—alongside the possibly cannibalistic process of eating mushrooms to restore health—and when Captain Toad or his accomplice Toadette dies, it lacks Mario’s sense of derring-do. You will not die doing something cool. You will walk off an edge and glide dumbly into purple lava; you will get hit twice by a Hammer Bro who seems to barely be trying; you will walk into a patch of Goombas wearing inner tubes who are waiting in line for a waterslide. You cannot jump and you cannot swim, and if you hit the “dig” button away from a plant, you perform a feeble little swat in the air that does exactly nothing. You beat the first boss in the game by running away from it. Treasure Tracker is not a difficult game by any metric except for the dignity of the Toad people. As is so often the case with Nintendo games, the core concept was conceived of abstractly, agnostic of franchise, but the tiny, rotating levels required a character who couldn’t jump like Mario or fight like Link. They needed someone weighed down, incapable of action, someone whose primary characteristic was merely the ability to toddle obediently. They needed a spare nub of a man to send hobbling through these labyrinths of death and they settled on—whom else?—the faithful attendant, no doubt mining all these gems and stars for the Mushroom Kingdom’s ruling class. The noble Mushroom People deserve a better life, but it’s hard to imagine a better game for them.